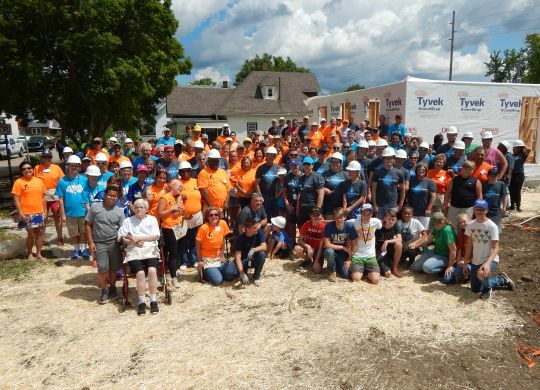 Day one of the 2017 Millard Fuller Legacy Build is in the books in Indianapolis with five new houses well under way in the east Indianapolis neighborhood best known as Tuxedo Park. But don’t let the name fool you. This is hardly a ritzy area. There is a plethora of run-down houses and vacant properties. Many windows are covered with boards, while some homes are in even worse shape with collapsing roofs or fire damage. Weeds dominate the front yards, and vines are strangling many of the homes. However, dozens of Fuller Center for Housing volunteers from across the nation are providing a tremendous lift to Tuxedo Park this week. 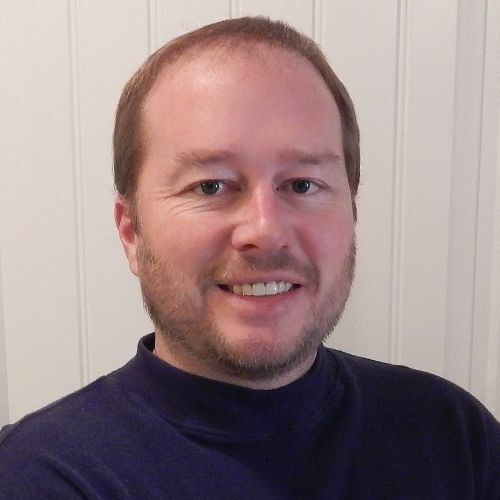 On Monday, they erected the walls and trusses for five new homes in the area — with Fuller Center of Central Indiana President Chuck Vogt noting that these are the first new home permits in this zip code in three decades. 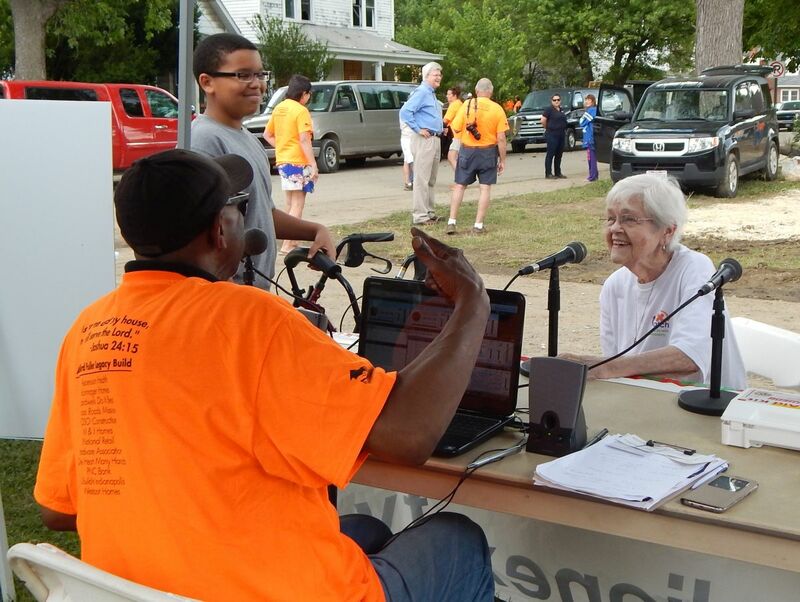 Coolgroove Radio personality Harold Bell interviews Patricia Vernon, president of the Grace Tuxedo Park Neighborhood Association, who is thrilled to see The Fuller Center working in her area. Patricia Vernon will not be living in any of the five new Fuller Center homes being built in her neighborhood, but she might have boasted the biggest and most enduring smile on Monday. She has lived in the same house on North Bradley Avenue for 78 years and has longed for a resurrection of the area she loves. Vernon spent Monday going back and forth on North Bradley with the help of her walker — thanking volunteers, chatting with the soon-to-be new homeowners and neighbors and even sitting down for a live, on-air interview with Coolgroove Radio personality Harold Bell who broadcast his show from the work site. Tia and J.R. Morris will move into a new Fuller Center home on North Bradley Avenue with their four children. The family across the street to which she was referring is the Morrisses — J.R. and Tia Morris and their four children. She added that she would become the first person in her family to be a homeowner, something which makes her more than happy to contribute the required sweat equity and future repayments. Licia Keiser and her mother Lynn on the job site Monday. Licia Keiser does not have any kids of her own, but her Fuller Center home likely will be bustling with even more youthful energy than the Morris house a block up the avenue. Keiser ministers to children in the area through her work with the nearby Shepherd Community Center, which works to try to break the cycle of poverty in the east side of Indianapolis. The only people more excited about her move into the neighborhood may be the very children to whom she ministers. 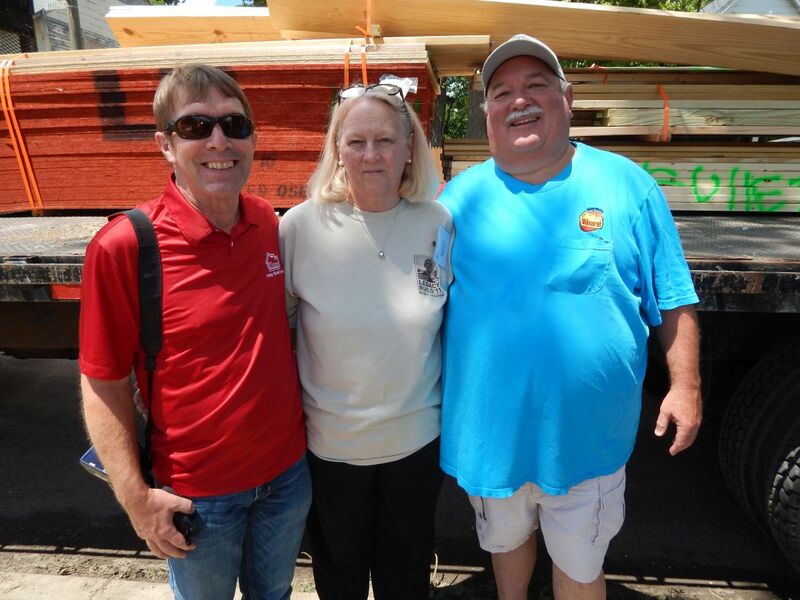 CrossRoads Missions’ Raymond Bodley (left) and Dave Lockwood work closely with The Fuller Center’s Brenda Barton to help Fuller Center covenant partners obtain wall packages for their new home builds. 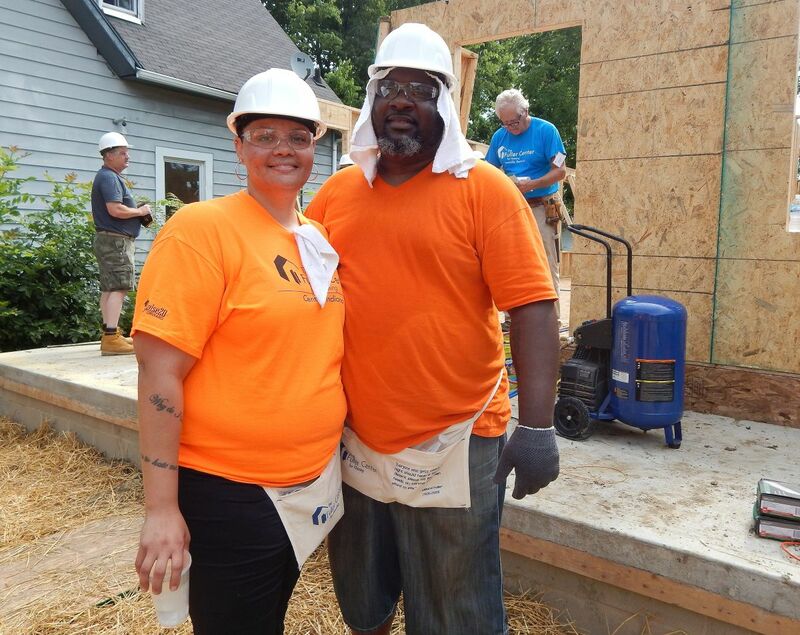 One of The Fuller Center for Housing’s most consistent in-kind partners is CrossRoads Missions, which provides pre-assembled wall packages for many new home builds. 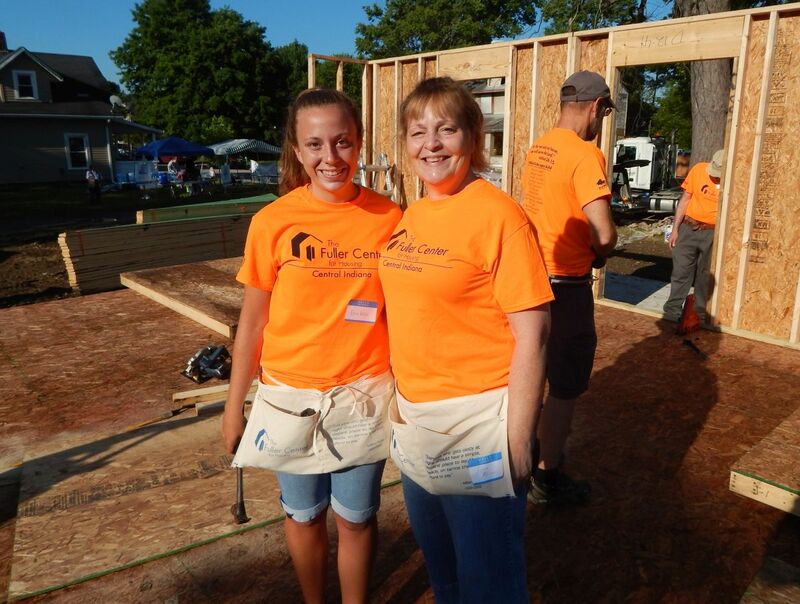 Working through its Help Build Hope program, volunteers assemble the walls per a house plan. The wall packages are delivered to Fuller Center covenant partners, allowing them to accelerate the building process. Thanks, Brenda. You’ll be quoted in a story before this week is over. Stay tuned!